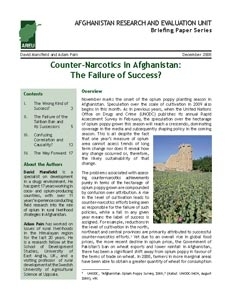 Counter-Narcotics in Afghanistan: The Failure of Success? The briefing paper argues that to truly understand what will create sustainable change in the Afghan opium industry, observers need to improve the tools being used to measure the success of counter-narcotics efforts. Measuring opium poppy-cultivated area serves as one of the few—and, in some cases, the only—means of gauging counter-narcotics success or failure. But relying on this indicator alone will not give policymakers an accurate sense of what drives opium poppy cultivation or what will sustainably reduce it. Until new indicators can inform counter-narcotic policy, perceptions of “failure” or “success” will likely continue to focus on short-term fixes rather than reach the root of the problem with long-term solutions. The paper concludes that a number of other indicators should be studied to improve policy concerning opium, including: incomes, physical security, food security, commodity markets and cropping system diversification. It also offers viable suggestions for ways to measure these markers of success or failure.